We have a beautiful Remington vintage typwriter to hire. With it’s quirky keys and black ink it’s one of those must haves at a vintage wedding. 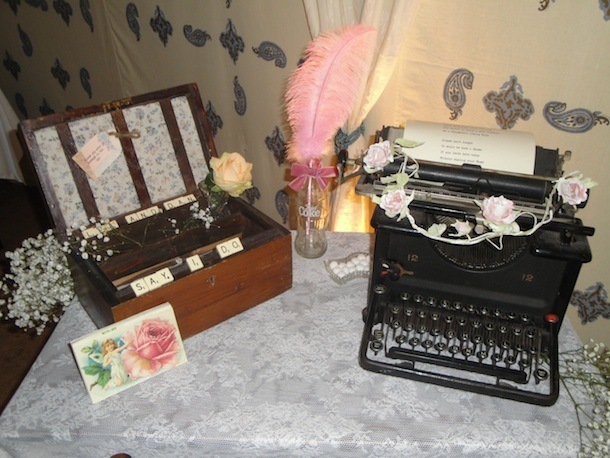 We love displaying our typewriter on the gift table, where guests can wish you all the best. Some couples use their own headed note paper, by drawing a picture on the header. These American made machines were among the most popular and widely produced typewriters in history. Most other brand machines followed the lead of the Remington. Our Remimgton was a gift from one of our lovely brides, Danielle Bourden back in July last year.